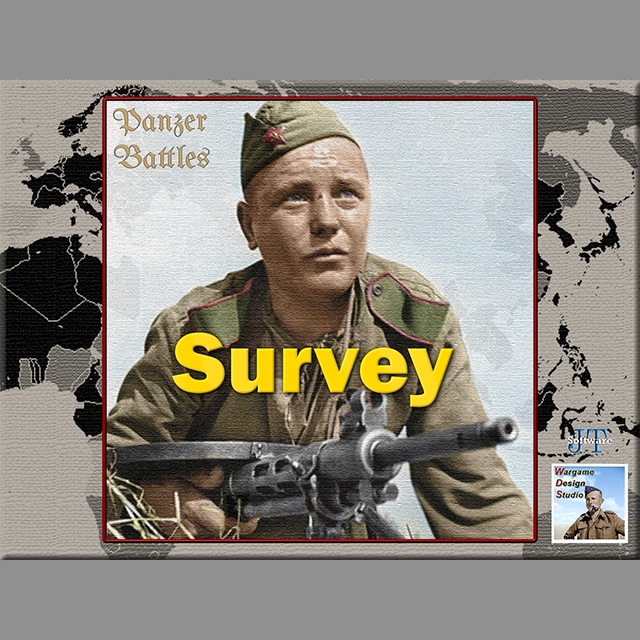 Hi there, we have just closed the Panzer Battles survey that was started on March 14th, 2018. 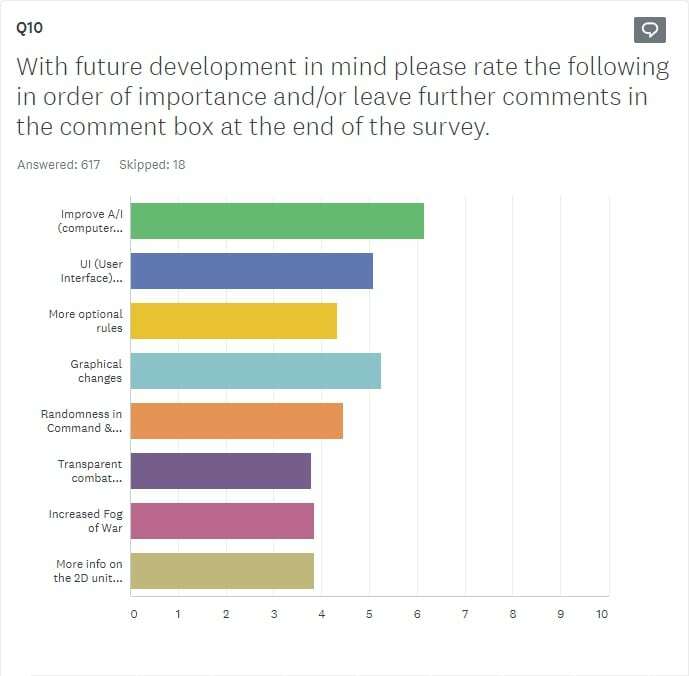 The survey was run to allow us to understand the community a little better and to ensure that we are putting our energies where it will have the most impact. Overall, we have some interesting results and would like to share them with you. In total we had 636 people complete the survey in an 8-week period. 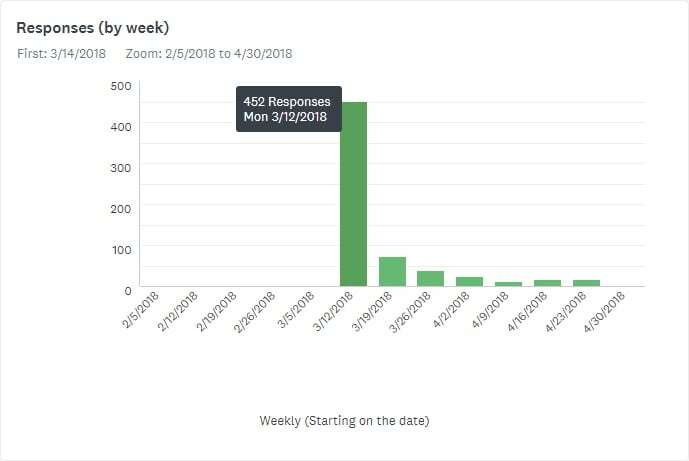 Impressively, 452 (71%) completed the survey in the first week. The volumes tailed away after that, but the overall response numbers were statistically significant. The first question was self-explanatory, allowing us to send the end results to those that requested it. Question 3, asked how you gamed. 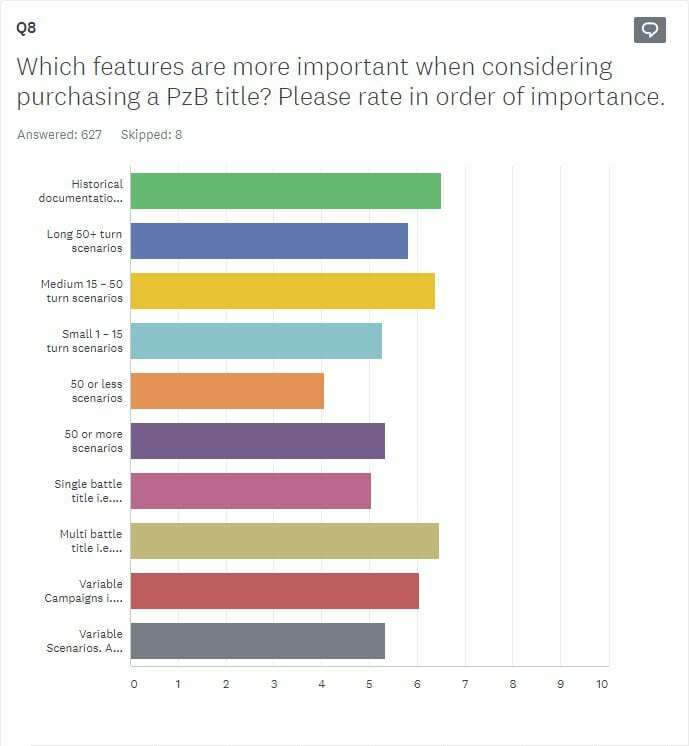 A massive 79% play solo and this clearly had implications for feedback later in the survey. Play by email was next with (only) 15% of the total. Game complexity was a bit of a surprise to us. 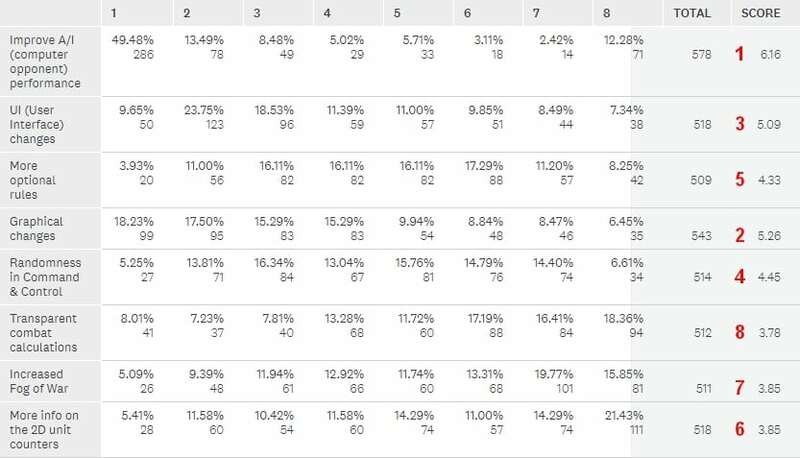 Having 91% rate the games as the right mix of detail vs abstraction shows that we have the balance right – or you’re all fan bois!!! All in all though, this is a positive in that it confirms we have a solid balance to begin with. The choice of settings for games was predictable. 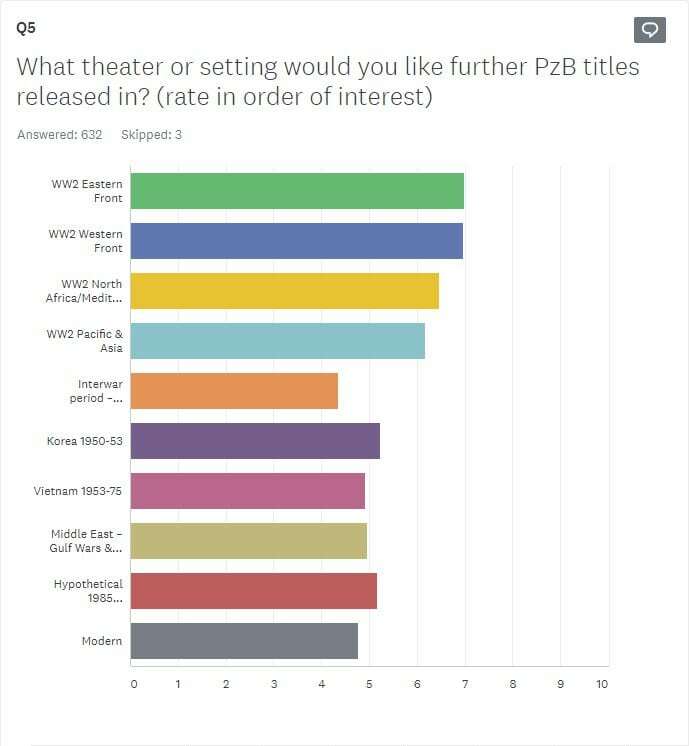 World War 2 came out as the most requested topics (the ratings are shown in red) with Korea 1950-53 and Hypothetical Warsaw Pact (1985) next. 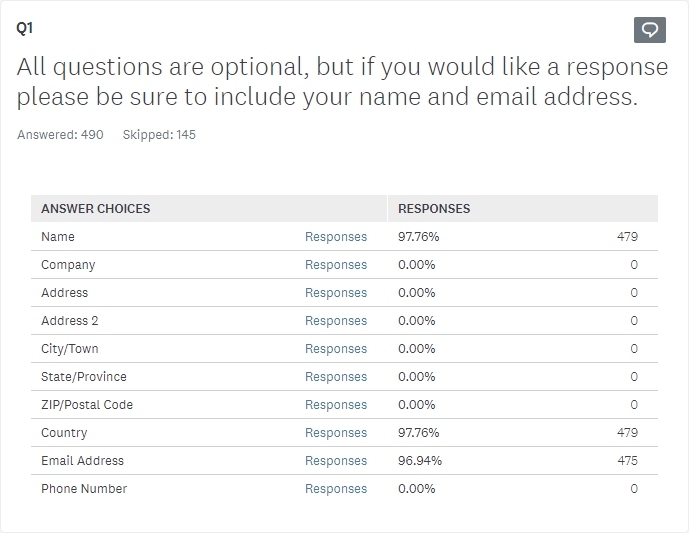 There was some confusion on how to do the one to ten ratings as shown by the comments at the end of the survey. For the record, it was intended for one to be best, ten to be worst. We will be clearer next time! 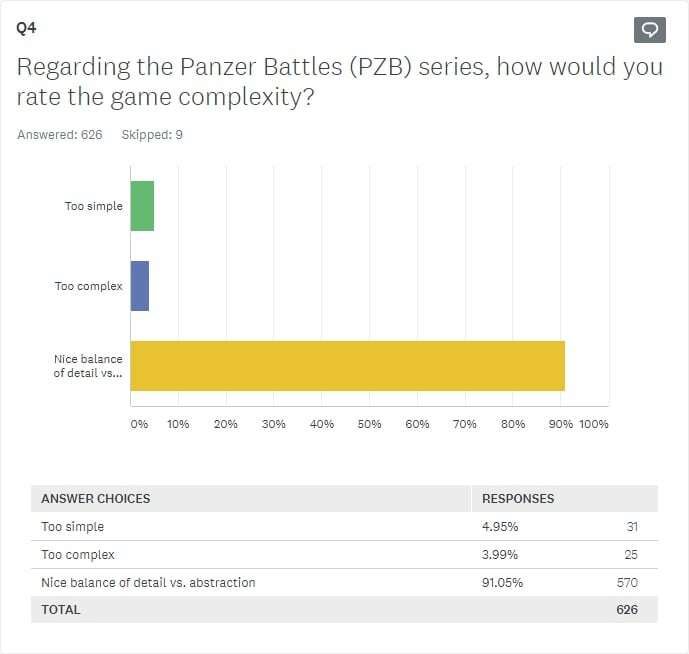 It’s great to see the number of people that tried out the Free Panzer Battles Demo. 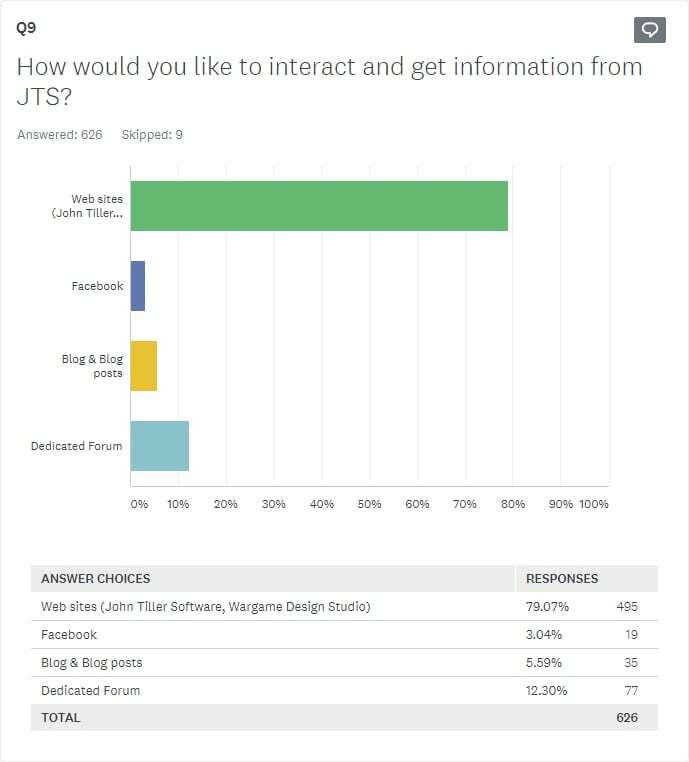 73% of respondents exceeded our expectations. That said, it was free! Question 7 was obviously related to question 6. 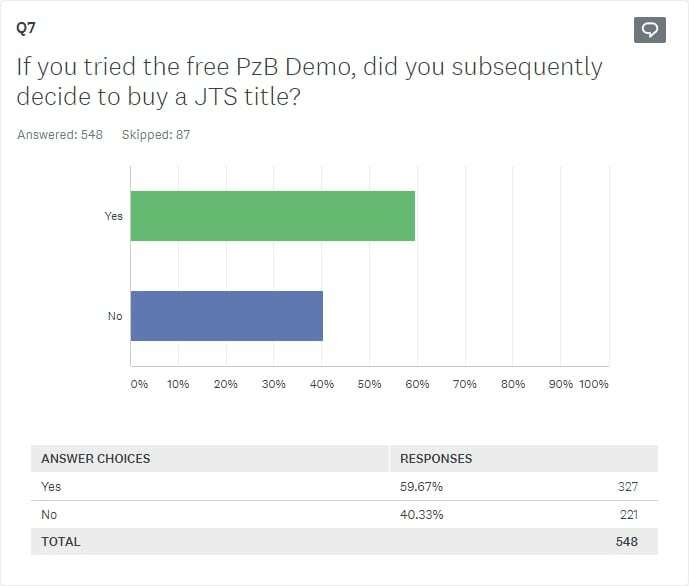 The value of the Demo as a marketing tool was shown with 60% of respondents choosing to buy a JTS title subsequently. 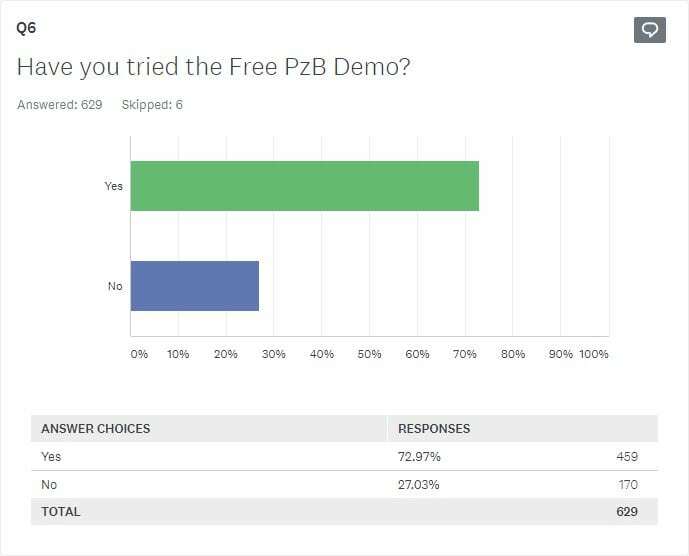 It’s open to question whether the Demo was the sole motivator, but overall, we believe the Demo has been an effective way to share the game system and get people talking about the various titles. Question 8 was important for us, the development team to know what features mattered to people. Surprisingly, documentation came out on top. Documentation, is hard, but important to show the research and design decisions that have been made when creating a game. Many of our customers are armchair historians and sharing our rationale for various design decisions has stopped (and started!) many ‘discussions’. Multi battle titles was a near 2nd – thank heavens we’re covering multiple battles in North Africa! 3rd was medium length scenarios of 15 to 50 turns. This has been a bit of a sweet spot for Panzer Battles, as this is essentially a day to two days of action. 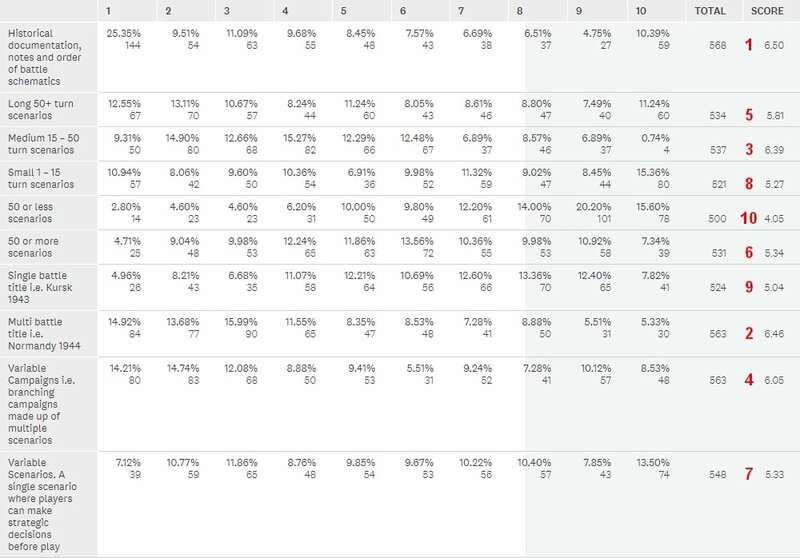 Personally, I was surprised variable campaigns were rated as highly as shown. These take a lot of effort, but when considering the number of people playing solo, this result shows people are looking for a richer single player experience. 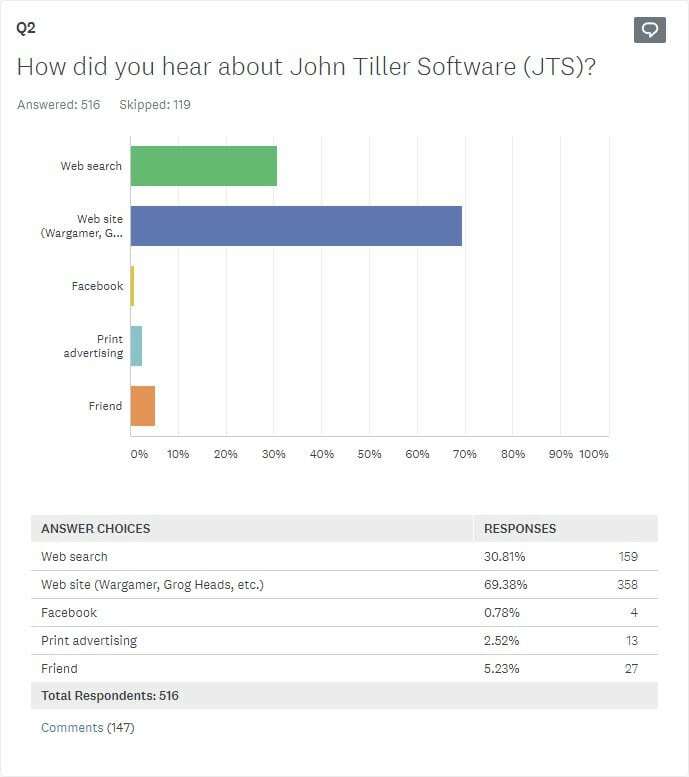 The importance of posting timely information on our websites was confirmed by the nearly 80% of respondents that want information from the John Tiller Software and Wargame Design Studio websites. We will look at how to continue to refresh content there and keep it relevant and fresh. The Wargame Design Studio site has just migrated to new hosting, which has improved performance and we’re looking at ways to get timely updates so there is a reason to visit regularly. Question 10 was probably the most important of the survey. We were looking for feedback on where people saw a deficit in the existing games, ideally to guide our future efforts. A clear priority was Improving the AI. 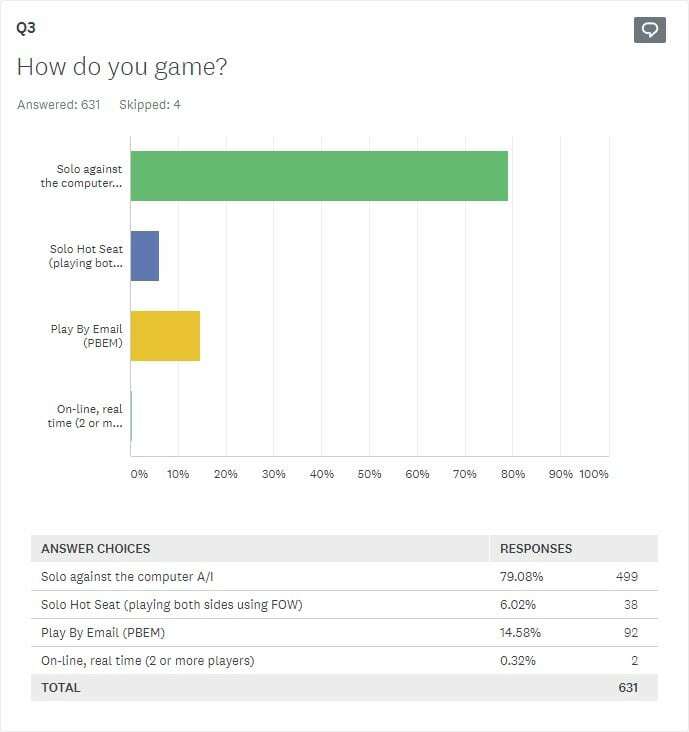 This is not surprising now that is clear so many of you confirmed in question 3 that you play the games solo. Of interest we have started this process with North Africa ’41, but this will be a long road as AI is a difficult area to master and rarely will the computer have the unpredictability of a human. That said there are areas we can see that can be improved. AI can also be influenced by some of the changes we’re making to victory calculations, so a number of these areas are inter-related. Second was graphical changes. As evidenced by the first release of PzB Kursk to today, we continue to tweak graphics to improve function & clarity. This is one of those areas that I doubt we will please everyone, but the focus is on continual improvement. A clear 3rd was user interface. As shown we have done a fair bit of work here, but there is potential to do more. The current UI requires a lot of clicks and there are things that could be done to reduce that or just the amount of physical mouse movement. Personally, I have a large PC monitor and I find that I’m always having to move to select units at the right when the action is in the middle of the screen. Reducing that amount of mouse movement would help. The other choices were rated significantly lower than the initial three. It was great to get so many comments from you all. The comments shared in the survey really provided the ‘meat’ of the respondent’s feedback. There were a vast range of comments and suggestions and not surprisingly, many were in opposition to each other. There was a broad range of feedback, but some themes came through. “I like the looks of the game. However, I would love to see a 3D-view just like in most of the squad battle-, Napoleonic, Civil War, Renaissance and Early American series of games. Preferably of the same quality in Campaign Petersburg!” There you go – we are setting the bar too high!! 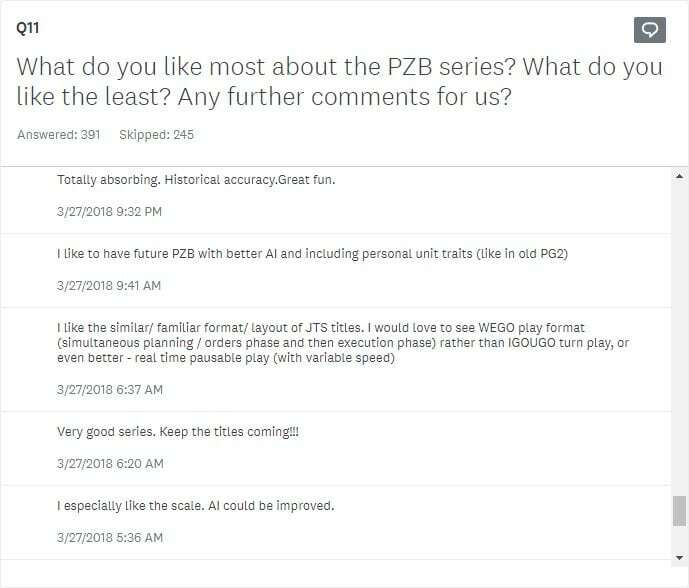 The above comments are just a few examples of feedback in the first ten pages of replies. In total we received forty pages of comments and are diligently going through them to see what we can do to improve our game titles. A number of the suggestions can actually already be done within the game system and it might be time to either publish a FAQ or update our game manuals. Something for us to consider. In closing, we would like to thank all that submitted their feedback. Your suggestions and commentary will help guide us on what needs further work and what interests the community most. Based upon the response to the survey we will look to do this on a fairly regular basis, probably varying the questions as required. Thanks again from all of us here at Wargame Design Studio and John Tiller Software. Thank you to emailing the results of your Survey. I think 3D graphics on 3D maps are a must. The gorgeous 3D maps of Panzer Campaigns look really ugly with those silly 3D blocks stacked on top of one another. I guess they’re a left over from board games and were used to attract that type of gamer but these are computer games which are more veratile. We always have a AI to play against, even if it does need a little more work in some areas. More scenarios and more and bigger maps that don’t take up a whole room in the house. Hell, we get just about everything bigger than a board game except the price, ours are mostly cheaper. Keep up the good work. Oops used the wrong email address, sorry guys, guess I’m getting on in life! Surprised but also relieved to see that the suggestion for WEGO is taken seriously. I was one of those who suggested it as a forlorn hope. The extraordinarily high quality of your games, Kharkov’43 too, means I do buy them. But they only just make the cut due to not having moved the core engine on to WEGO. The documentation/notes and such to your games is stunning. But for me, one day, IGOUGO will seem too clunky. All the best, Kip. Why is the Hex Info Box smaller in PanzerBattles than in Panzer Campaigns? With a 4k monitor it’s too small. They are actually the same size (I just went and checked). That said, we are thinking of alternative ways to show that information as the size is static in the JTS games and the larger, high resolutions screens are causing issues. I can’t upload a picture but could email one too you. The PanzerBattles info box is much smaller than Panzer Campaigns. I’ts on a 32″ 4k monitor. Is it all the screen graphics or just the info box? We have seen something similar in the past and it was due to the scale settings under display settings in Windows 10. Panzer Battles uses later Microsoft DX executables and we have seen that have an impact. “I run Windows 10 at 3840×2160 in an LCD TV in my livingroom. In display settings I set scaling to 175% for a good size of fonts and window menus, etc. Both PzB Kursk and Normandy worked well for me in this setup, but PzB Demo zoom levels look considerably smaller, menu fonts and buttons are smaller and harder to see, etc.